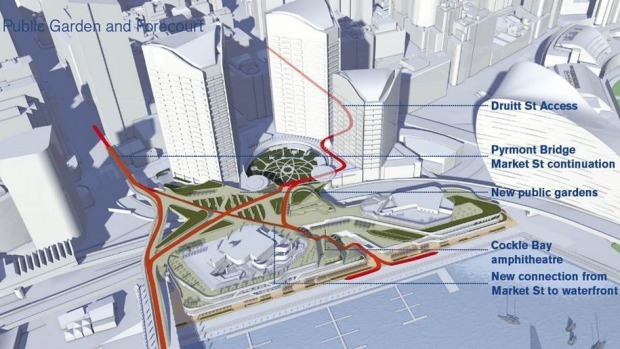 Darling Harbour $1 billion revamp! The co-owners of the site at Darling Park, GPT, AMP and Brookfield, will join forces to revitalise Cockle Bay Wharf, which spans the eastern side of Darling Harbour from the Pyrmont Bridge and south towards the Imax Sydney. The first of the three office towers opened in 1994, while the Cockle Bay restaurants followed in 1999. But in the past three years the surrounding areas have changed with the construction of Barangaroo, Darling Quarter, the International Convention Centre and new Sofitel hotel, as well as the proposed redevelopment of the Imax theatre into a hotel called The Ribbon project and the former Entertainment Centre into the City of Sydney library and roof top bar. In time, Mirvac, the owner of Harbourside shopping centre, will undertake a revamp of the mall, as the final piece of the Cockle Bay upgrade. GPT's wholesale office fund will co-ordinate the Darling Park project in the area that was the first to open at Cockle Bay in 1995. The main tenant is now the Commonwealth Bank, which may lose some of its views with the new tower.